The remarkable, true story of a slave who gained fame as a gladiator and led a revolt against Roman slave owners. Specially written for children growing in reading confidence. 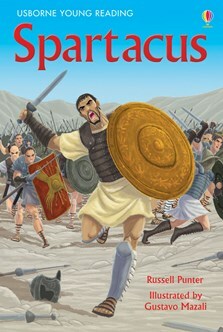 Accused of deserting the Roman army, Spartacus finds himself sold into slavery. When he is forced to join gladiator school, only one thing is on his mind – escape. With dramatic illustrations that bring the story to life. Includes a glossary, timeline, maps and internet links to recommended websites to find out more.